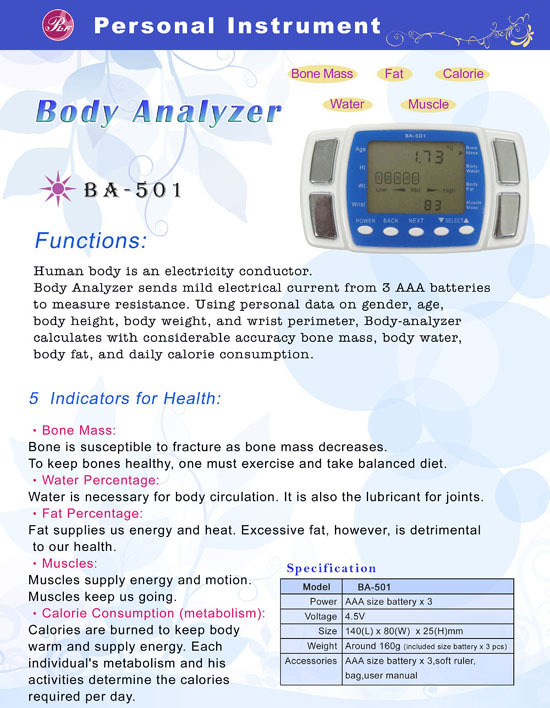 Taiwan Beauty Equipment Body Analyzer(BA-501), Analyzer, Beauty Equipments - Palifull Co., Ltd.
Human body is an electricity conductor. mass, body water, body fat, and daily calorie consumption.
? Water Percentage:Water is necessary for body circulation. It is also the lubricant for joints. fat, however, is detrimental to our health. keep body warm and supply energy. the calories required per day.